A parliamentary report of 1777 recorded a parish workhouse in operation at Fordingbridge for up to 70 inmates. Fordingbridge had parish workhouse on Shaftesbury Street, possibly dating from the seventeenth century. It was partially destroyed by a fire in 1830. Hampshire: Breamore, North Charford, South Charford, Fordingbridge (3), Hale, Rockbourne. Wiltshire: Martin, South Damerham, Whitsbury. Later Additions: Ashley Walk (from 1868), Toyd Farm and Allenford, Woodgreen. The population falling within the union at the 1831 census had been 5,567 with parishes ranging in size from South Charford (population 67) to Fordingbridge itself (2,611). The average annual poor-rate expenditure for the period 1832-35 had been £4,754 or 17s.1d. per head of the population. 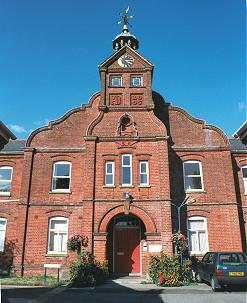 Initially, Fordingbridge made use of the existing parish workhouse accommodation at the south side of Shaftesbury Street. In 1835-6, the Poor Law Commissioners authorised an expenditure of £820 on its adaptation for use by the union. The site is indicated on the 1871 map below. In 1885, a new Fordingbridge Union workhouse for 100 inmates was erected on a 4½-acre site at Barton's Road in Fordingbridge. The building was designed in a simple Queen Anne style by Fred Bath and cost £7,800 plus £1,400 for the cost of the land. The workhouse location and layout are shown on the 1908 map below. Two single-storey entrance blocks stood at the south of the site. The right-hand (east) one contained the porter's room, receiving wards, bathroom, vagrants' cells and day room, labour shed, and a clothing fumigation room. The left-hand (west) contained the Guardians' board-room, waiting room, rooms for aged married couples, shoemaker's room, and a store for inmates' clothes. Fordingbridge from the south-west, 2000. The T-shaped main building contained the Master's office and accommodation and the inmates' dormitories and dayrooms. 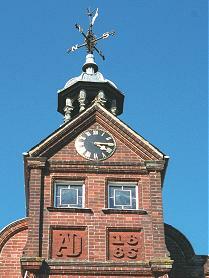 The striking clock in the tower was the gift of Sir Edward Hulse. 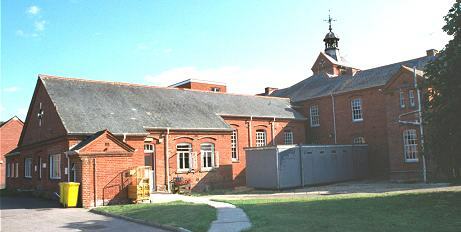 The central rear wing of the main block contained the workhouse dining hall and kitchens. Fordingbridge rear of main block from the north-west, 2000. A separate children's block at the west of the site included boys' and girls' dayrooms, classrooms, a Mistress's room, and the children's dormitories, bathrooms and lavatories. After 1930, the Barton's Road workhouse became a Public Assistance Institution. In 1948, it became part of the new National Health Service as Fordingbridge Infirmary for the Chronic Sick. The site is now the home of Fordingbridge Hospital. Most of the original buildings still exist. Hampshire Record Office, Sussex Street, Winchester SO23 8TH. Very few records survive. Holdings include Guardians' minute books (1835-1919). A History of Fordingbridge and Neighbourhood by Reginald Hannen (1889).